Since the days of Benjamin Franklin’s London Coffee House to today, it is well-known that caffeine makes the world go around. There are many types of caffeine, but coffee is the most popular way to get your fix worldwide. Coffee beans vary in their caffeine content and flavor. There are two types of beans. Arabica is the finer, more drinkable variety of coffee. It grows at high altitudes and is finicky, which is why it’s the more expensive variety. The demand also drives up the price. It is 60 percent of the world’s coffee crops. Originating in Ethiopia, this chocolate-, fruit-, and berry-flavored bean is grown in Costa Rica, Mexico, Guatemala, Ecuador, Colombia, Ethiopia, Burundi, Brazil, and Rwanda. It has less caffeine and fewer calories — but more sugar and antioxidants. It smells like blueberries when roasted. Robusta is from sub-Saharan Africa, and is 40 percent of the world’s coffee crops. It is grown in Africa, Indonesia, and Vietnam, its largest producer. It’s also grown in Brazil, India, Uganda, Malaysia, Thailand, the Philippines, and Guatemala. It smells and tastes like peanuts. It has more caffeine, but less sugar and antioxidants. It’s found in blends and mixed with things, and it’s cost-effective and a filler for Arabica beans. Robusta is commonly used for espresso. Robusta is more resilient to weather conditions and disease, such as leaf rust, a killer of Arabica. It also prefers lower elevations. Whether one tastes better depends on the roasting process. 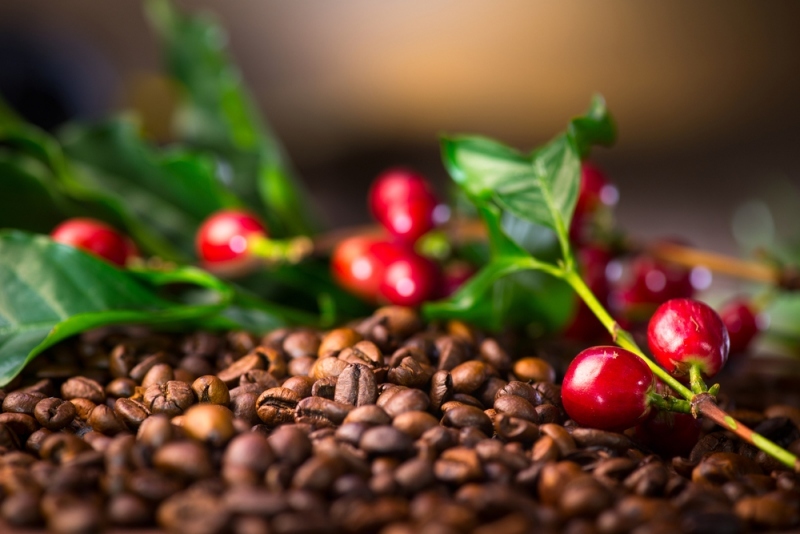 Light roasts still contain the oils and more natural flavors of the bean, making it a popular choice for Arabica beans. Medium roast will taste more roasted and sweet because the sugars have begin to come out, so both beans take it well. Dark roast has all the sugar, oils, and less coffee bean flavor. It takes strong, spicy and is more suited for Robusta beans. Single roast beans can be found, but mixes are common. Light and medium roasts pair together well, as do medium and dark roasts. The longer and rougher a bean is roasted, the more caffeine your coffee will have. The less roasted it is, the less caffeine. Decaffeinated coffee beans are soaked in water, drained, then roasted. Like barbecue, what it’s brewed with matters and imparts flavor. Coffee pulled in the traditional Ethiopian ceremony tastes earthy, like coffee, because of the open flame used. Bosnian coffee uses a similar method. If you use wood, coal, or electricity, the flavor will be different, as will caffeine levels. Water quality and what you drinking out of also affects the flavor. Water quality, and water itself, varies across the world. Better water, better coffee, different minerals, different flavor – with even the same bean and grind. Grinding the beans also matters, the finer the grind, the finer the flavor. The rougher the grind, the more earthy coffee flavor. How it’s ground also affects the flavor. Traditional grinding results in an earthy flavor, machine grinding results in a more bland, but not bad, flavor. Mortars and pestles aren’t always an option. If you need a quick fix, a rough, long brewed, roughly grinded Robusta does the job, or espresso. For an average fix, either bean will do, as long as it has been treated gently, tenderly brewed and grinded — within reason. For a low and slow fix, a smoothly grinded Arabica brewed quickly and mechanically does the job. Whatever you’re after, a coffee subscription likely has a bean for you. Whatever your grind, you need a good coffee grind that you can get every month in the mail. No matter how hectic and coffee-fueled your life is, convenience is everything.